Do any of my readers suffer from an irrational fear of heights? It’s apparently called “acrophobia” and I am a major sufferer. 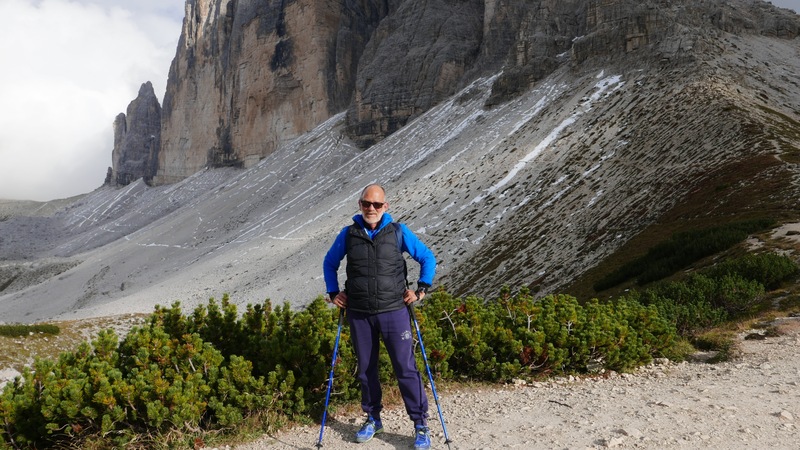 So, when I recently visited the Alta Pusteria area of the Dolomites and was persuaded to circumnavigate the Tre Cime di Lavaredo, I had no idea what I was letting myself in for. In early September fellow blogger Tom Weber, The Palladian Traveler, and I were in the Alta Pusteria area of the South Tyrol. This is a truly beautiful part of the Italian Dolomites and we were there as lucky guests of Christian Pircher of the Hotel Adler in Villabassa. Christian was encouraging us to try many of the summer pursuits available, which are quite a contrast to the normal winter activities, for example settimana bianca (white week), when skiers assemble from all over the world to ski in the popular resorts which dot the region. 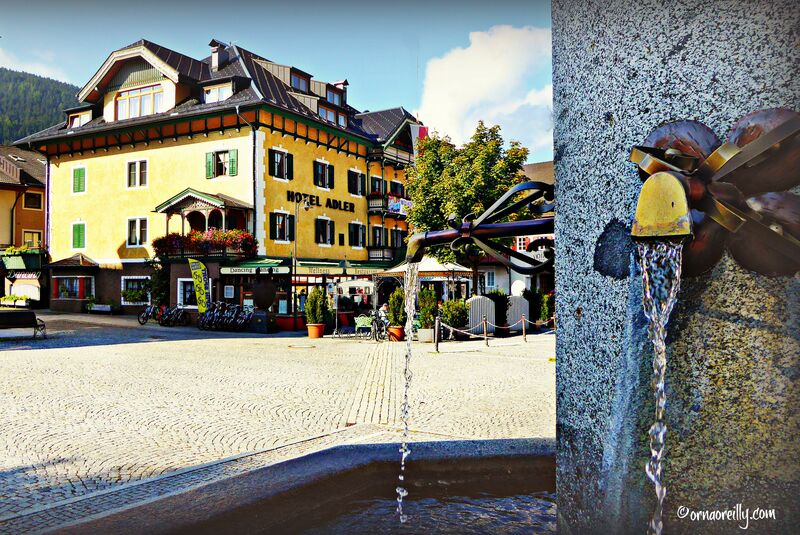 Having taken Christian’s advice the previous day to cycle from San Candido to Lienz, which was a resounding success, I felt confident that this new recommendation would be an enjoyable way to spend a relaxing day in the Dolomites. And who, after all, is not familiar with the iconic sight of Tre Cime di Lavaredo? Being a keen walker, I couldn’t wait. Next morning, Tom and I drove the 40 kilometres, or thereabouts, towards Cortina, into the picturesque area dominated by the huge craggy peaks of the Dolomites. 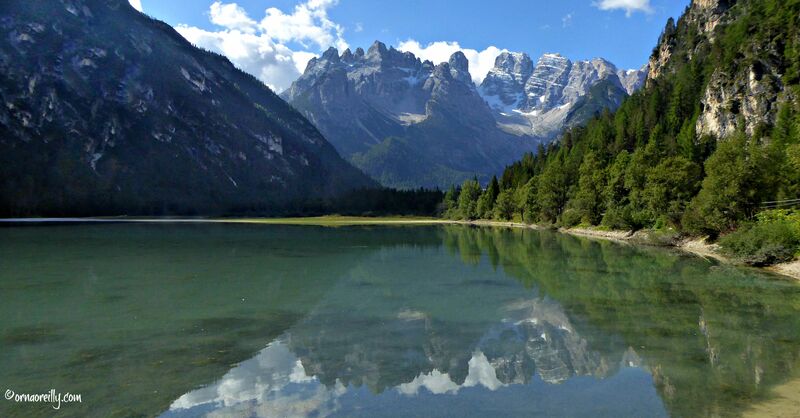 We stopped en route to take some photographs of Lago di Landro, with its stunning views of the Cristallo mountain range. As we approached Tre Cime, we were surprised to come to halt at a toll booth and to pay €20.00 to bring our car inside. A series of sharp bends then took us steeply uphill to a carpark, where Rifugio Auronzo is situated at 2320 metres above sea level. Getting out of the car we found that at that altitude it was quite chilly, so we donned our wind-breakers and gilets, grabbed our walking poles and set off on the most populated trail, the anti-clockwise 101, which was crowded with a strange mixture of serious hikers, ill-shod ladies, couples pushing baby-buggies, young children on foot and a golf-cart transporting some less fit souls to a little church where they could take photographs of the view. All pretty busy. After a while, a small detour seemed to be in order and we went off the trail to admire Lago di Santa Caterina, which was in the valley far, far below us at Auronzo di Cadore. Then back to join the hordes of walkers jostling for space on the wide path. After we had passed Rifugio Lavaredo and left it in our rear-view mirror, so to speak, the crowd thinned out considerably. Gone were the babies in buggies and the ladies in unsuitable shoes. Only those who wanted to walk to the Forcella di Lavaredo at 2454 metres remained, though there were quite a few red faces to be seen and a fair bit of puffing to be heard from the less fit. We soldiered onwards and upwards to see the spectacular north walls of Tre Cime. I was surprised at how many people continued along the trail at this point and managed to make the tiring hike down to Rifugio Locatelli, where we stopped for lunch. A bratwurst and small beer were gratefully consumed and here’s where things started to go pear-shaped for me. First of all, I thought that we were almost at the end of the trail and had no idea that we were less than half way around. Something had got lost in translation and I can only blame myself for this. It’s a 9.5 kilometre hike and I felt that we had easily covered this distance already. But no such luck. On leaving the rifugio we took Trail 105, which was much narrower than Trail 101. I had noticed that almost everyone else had begun their return to the car-park via Trail 101, but accepted this without analysing the possible explanation. They knew more than I did! Trail 105 was rocky and steep, and before too long we arrived at what can only be described as a narrow shelf overlooking a sharp, seemingly bottomless drop. I froze. My acrophobia – fear of heights – kicked in so strongly that I burst into tears. I felt incredibly foolish and poor Tom had a terrible time coaxing me across the ledge. He held my walking poles and took my arm while I walked sideways, facing away from the terrifying drop. Following a fairly long descent to the valley floor we took a steep uphill climb, so steep that I felt that if I fell over I would tumble to the bottom. I tried not to dwell on this and reached the top, fully expecting to see that we were back at the carpark. But, sadly, no; we were still a couple of hours from Rifugio Auronzo and there were further frights ahead. I honestly thought I was not going to make it and that I would have to spend the night freezing to death on the slopes of Tre Cime. Eventually, more than five hours after we had begun our hike, we arrived back at the car and I realised by the set of Tom’s chin that it had not been my finest hour. Heading back to the Hotel Adler for a welcome aperitivo I was relieved to be in one piece and to know that I had walked the most beautiful trail in the Dolomites. But, never again. 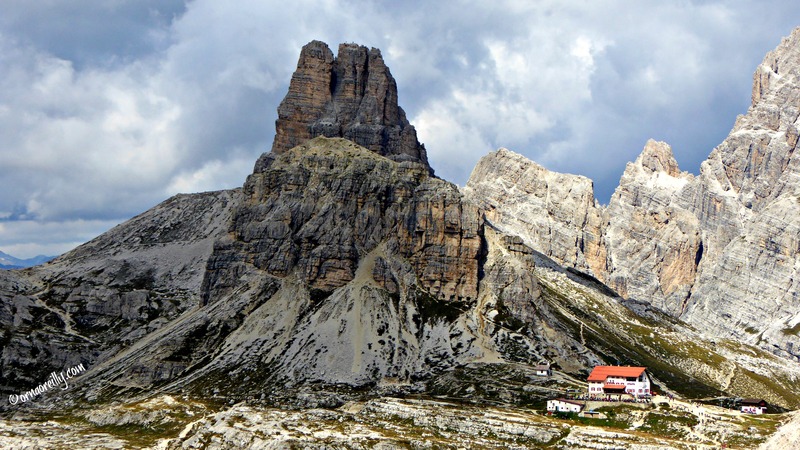 For full details on Tre Cime di Lavaredo click HERE. I have a fear of heights as well. I’ve had to conquer it more than a few times, but it never seems to go away, just into lurk mode, ready to try to pop out another time. Gorgeous photos, though, doubly appreciated knowing what you went through to get them. Despite your fear of heights, you captured the Tre Cime with your camera like a pro. Taking me back to my time with gli Alpini! I know those three peaks, having traversed each one from bottom to the top. Beautiful vistas from each one. Wow Orna, God bless you I am so proud of you for being so brave. I have fear of heights and I know I couldn’t never do what you did. I know for sure that I would have to be carried off of the mountain with very dark glasses on. Thank you for sharing the spectacular photos with us. They are absolutely stunning. Wow Orna, spectacular views over the craggy Dolomites!! And I’m not surprised you had a meltdown, it’s only natural unless you are a mountain goat!! That would be my reaction too!! Keep up the great posts! 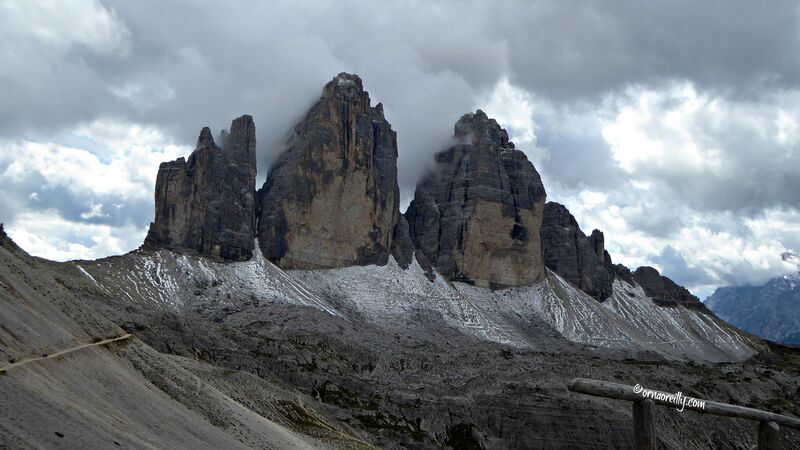 i am going to Cortina in a few weeks, excited but a little nervous about going to Tre Cime! I honestly wasn’t too bad until we took to the much narrower track that takes you around the back of the Tre Cime. That was after lunch at the 2nd rifugo. Most people turned back at that point….if your head for heights is bad, I would recommend that course of action. Good luck!